A few years ago I posted an article here on Ex-C about Christmas. It was titled "The Most Miserable Time of the Year" in reference to that popular Christmas song sung by Andy Williams---only he sings the word "wonderful" instead of miserable, of course. I grew up an only adopted child with older parents who loved and supported me more than any one person probably deserves. My parents were my world---my dad was the most fun, playful person, with these twinkly eyes, a mischievious smile, and a fantastic sense of humor. My mom was quiet and reserved, but she also had a great sense of humor and was the best listener I have ever known. She was an extremely non-judgemental woman who truly lived the saying, "Don't judge another person until you have walked a mile in their moccassins." There's no doubt that I got my playful spirit and counseling ability from my wonderful parents. My parents did not go to church, but as did many parents of the 1950's and 60's, they entrusted my spiritual education to the nearby southern Baptist church. They dropped me off there every Sunday for Sunday school and church, and picked me up afterwards. They were totally unaware of the crap I was being taught, and that I was terrified of hell and everything to do with the Bible. I didn't tell them how much I hated and dreaded church because I loved them and I wanted to please them. And, being a child, I figured they believed in what I was being taught. They were C & E Christians---they attended church on Christmas and Easter. They had both been baptized as adults after they married, but that was the extent of their religion. They had been married for 17 years when they adopted me and their church going days were way behind them. We did not pray before meals or before bedtime. In fact, we never talked much about religion as I was growing up. Mama did love watching Billy Graham crusades on TV though, and I watched them with her. I liked watching with mama, but I didn't care much for Billy's scary messages. I vaguely remember being in a Christmas pageant at about the age of six. I had to memorize and recite the verses from Luke about Christmas---the King James version, of course! I recall thinking that it was funny that the shepherds were "sore afraid"--what the heck did THAT mean? My parents helped me memorize the verses and beamed with pride when I recited them at the pageant. I liked the Christmas story---I've always been an animal lover, so I was attracted by the idea of animals being around the manger. Christmas morning was a HUGE deal at our house. 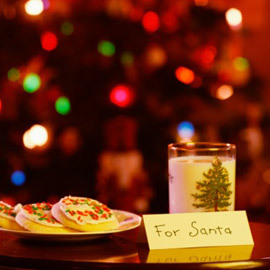 The night before Christmas, my parents and I would put cookies and milk out for Santa and I would be tucked into bed with assurances that Santa was on his way. (We didn't have a fireplace, but he could come through the front door, they told me.) My parents didn't buy me much throughout the year, but they went crazy at Christmas time. They literally turned our living room into a toy store! I can remember waking up to my dad shining the bright lights of his moving camera on my face and him filming me running into the room and getting so excited about all the gifts on display around the tree. I was terrified of Santa Claus though---I took the lyrics to "Santa Claus is Coming to Town" very literally and I didn't like the idea of him seeing me when I was sleeping and awake. I was as frightened of Santa as I was of Bible God, and even though I was a very good little girl, I always worried that I would not meet Santa's expectations. I figured out that Santa was not real when my best friend told me during our school Christmas party in third grade. When I got home that day, I asked my mom about it and she told me that Santa represents the "spirit of giving", but that no, there is no Santa living at the North Pole with elves as his helpers. I was not disappointed to hear this---I was, in fact, relieved. I could stop worrying about him "watching" me all the time. Whew! And so my parents and I rocked along through the years enjoying each other and never missing a Christmas morning together. Christmas was all about us being together and loving each other and exchanging gifts and eating good food. It was a magical, precious time. Part of our decorations was a simple nativity scene that we always set up near the tree, but other than that, religion was not mentioned. When I was in my mid-twenties, my parents began going to church with me. By that time, I had left the Baptist church and was going to a liberal Presbyterian church. The three of us attended that church together for ten years. We began attending Christmas Eve services during that time, and I loved standing next to my mom and dad, each of us with a lit candle in our hands, singing "Silent Night" together. My mother had a beautiful voice, and it was comforting to hear her singing next to me. All was right with the world. And then, on my mother's 73rd birthday, my dad unexpectedly dropped dead of a heart attack. Mama and I were totally devastated. This was in September 1991, and I don't even remember the Christmas after that, except that it was extremely hard. After losing my dad, my mom's recurring episodes of crippling depression returned, and 15 months later, she put a gun to her head and killed herself. That was on December 13, 1992--twelve days before Christmas. I don't remember that Christmas either. After that, my husband and I began going on vacations at Christmas time. I gave away all my Christmas decorations and didn't put up a tree for many years. I still only put up a tree occasionally, when I am in the mood, which is not very often. Some years, we spend Christmas with my cousins, and it's OK. But, the joy of Christmas that I had experienced with my parents has eluded me ever since their deaths. I've attempted to start new traditions for Christmas Day, but the bottom line is that I stopped caring about Christmas when I could no longer share it with my mom and dad. I'm childless by choice, so I don't have children (other than my cousins' children) to shop or plan for. I do buy gifts for Angel tree kiddoes every year, but that's the extent of my giving. And then when I stopped believing in Bible God, Christmas completely died for me. Maybe I should give Christmas a decent burial and let it rest in peace, once and for all. But that's awfully hard to do in our culture here in the southern USA where my neighborhood Cracker Barrel restaurant put up Christmas trees on September the first!! I kid you not. I actually talked to one of the employees there and told them to tell the manager that September is too danged early for Christmas decorations!! I do miss the Christmases of my childhood. They seemed so simple. My stocking was stuffed with nuts and fruit and many of my toys were home-made. Mama was a great seamstress and made clothes for my Barbie dolls! My grandmother made me many beautiful, frilly dresses. Daddy built me a dollhouse out of wood. Aunts and uncles and cousins stopped by and we would visit for hours. I know now as an adult that the 1960's were a time of historical upheaval in many ways, but in my world, there was nothing but love and innocence and goodwill. Other than my mother's bouts with mental illness and attending the Baptist church, I had a near-perfect childhood. So, now, Christmas is just another day of the year, and I get by as best I can. I count my many blessings---I have a loving husband; I go to a fabulous Unitarian Universalist church; I have great friends of many different beliefs; and I am healthy. I have happy memories of the holidays, which I cherish deeply. Maybe, now that I think about it, Christmas is not so bad after all?